Lewis Hamilton has apologised after his Mercedes road car was impounded by Melbourne police on Thursday evening. The 25-year-old, who set the fastest time in Friday's Australian Grand Prix practice, is expected to be charged with improper use of a vehicle. McLaren's 2008 Formula 1 world champion admitted: "I was driving in an over-exuberant manner and, as a result, was stopped by the police. "What I did was silly, and I want to apologise for it." The news broke hours after Hamilton recorded the quickest time in Friday's second practice session. His time of one minute, 26.801 seconds, was 0.25 seconds quicker than McLaren team-mate and current world champion Jenson Button. Police constable Scott Woodford said Hamilton's rear wheels were skidding as he accelerated out of Albert Park, where Sunday's race is being staged. "Given that Melbourne's on the world stage with a lot of interstate and international visitors, we would expect drivers to observe road rules," he said. A Victoria police spokesman added: "The vehicle was seen to deliberately lose traction and was intercepted by police. "The driver, a 25-year-old man who resides in Switzerland, was spoken to at the scene and is expected to be charged on summons with improper use of a vehicle. "The vehicle, a 2010 Mercedes, was impounded for 48 hours and the driver returned to his hotel." 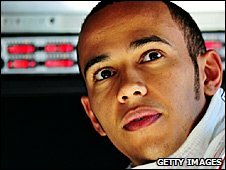 It is not the first time Hamilton's driving has put him in trouble with the police. In 2007, his car was impounded in France after he was caught speeding. Earlier this month, Hamilton insisted there would be no 'wild side' to his character emerging following his decision that his father Anthony should no longer manage his career. "I don't think so," Hamilton remarked at the time. "I am who I am. I don't think anybody has stopped me from being who I wanted to be. "When I arrived in the sport, I didn't go out and buy a million different cars, I took my time. "Maybe I might buy one car this year, who knows. But that's not being wild. "I've still got the same girl, I race for the same team and I've still the same dedication and determination."